Love is often in the air in WWE but the path to true love very rarely runs smoothly in the world of the squared circle. 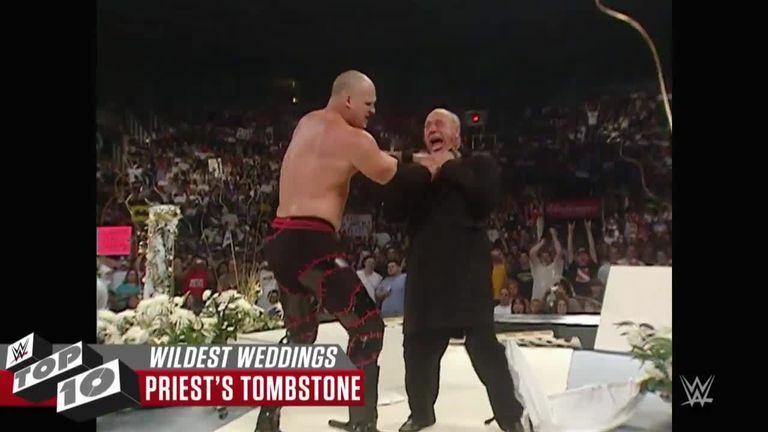 There has been no shortage of romantic moments throughout the history of sports entertainment, from wedding proposals to the ceremonies themselves. As anyone who follows WWE with any degree of enthusiasm will know, such situations don't always unfold in the, shall we say, traditional manner. Of course, sometimes they do, and many superstars have found legitimate true love with others away from the glare of the cameras. But on this Valentine's Day we look back at the times potential marital bliss turned into pure mayhem in a countdown of the 10 wildest moments in the world of WWE romance. WWE Elimination Chamber takes place this Sunday, with Daniel Bryan defending his WWE title in a six-man Chamber match and new women's tag-team champions being crowned. Click here to order the event, which gets underway at midnight, on Sky Sports Box Office.